I could tell the Guild member who suggested that I be the one to use some of the plant dyestuffs that have been left at the Guild was as appalled as I was to see that there was a large plastic bag full of packs of lichens in one of the cupboards. They were packaged up in such a way as to suggest they might have been purchased dried from a supplier in a time when understanding of the precarity of lichen was less widespread. Concern for the wellbeing of dyers and the planet is widespread at the Guild now and I assume, it was widespread there in the past when levels of information were different, too. I think it would be well recognised now that these are not sustainable dyes. And to be honest, the descriptions of the colours some of these lichens will give made me wonder why anyone would disturb something so slow growing when there are prolific sources readily accessible in the suburbs. No point asking now. No way to know when these lichens were harvested, either. I am guessing, many years ago. The only thing sadder than these lichens having been killed for dyeing would be composting them without using them at all–So I chose one of the types of lichen for which I could readily find instructions and began what is going to be a lengthy investigation. Out of the bag with ‘Usnea spp’ and into rainwater for a long soak. I took Karen Casselman’s advice and steeped for some days in an alkaline solution before heating and cooling several times. On the big day (9 days after beginning), I strained out the lichen—using a pair of preloved pantyhose which had been thoughtfully brought into the Guild for just such purposes to strain out all the itty bitty lichen particles. 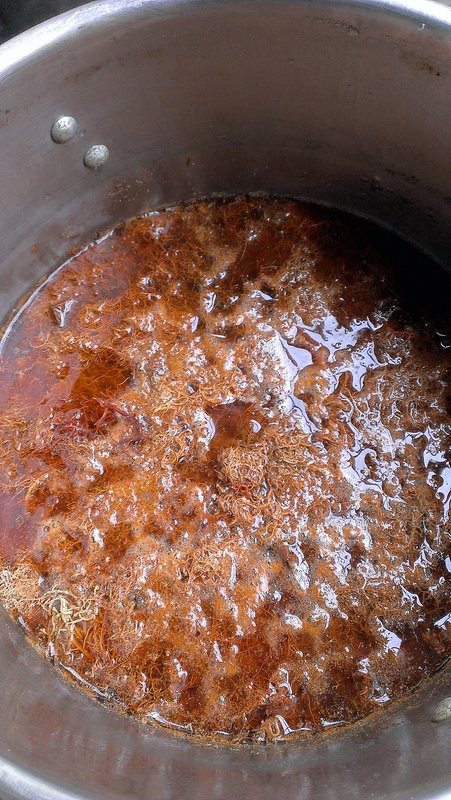 Then the diluting, heating and dyeing began. One of my new rolls royce sampler cards (two different mordants, two different applications of each) and 50g of Polwarth entered the pot. 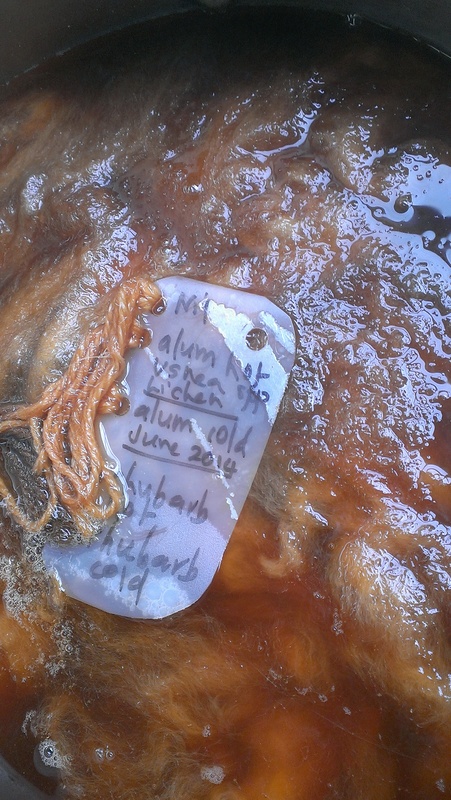 I simply don’t have the experience to know whether I did something wrong, or the age of the lichen made a difference, or what-but both my sample card and my fleece turned tan while the dye bath remained orange. Not so special, in my opinion. I checked with my sweetheart, who was a long time woodworker. She said ‘looks and smells like meranti to me’. This looks quite unlike osage orange, sandalwood and logwood (all of which were present in the trove from the Guild). I did a test… and nothing exciting happened. 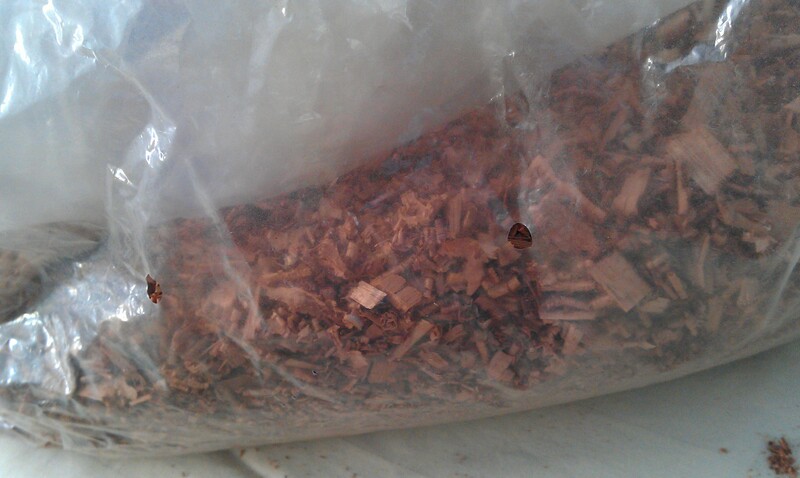 This batch of wood shavings went to the compost. The rest was sorted out and repackaged and relabelled where necessary. Ready for further dyeing adventures! From what I have read the best is to keep the fibre and lichen in one pot, but it’s often tough job to clean the fleece afterward. Also, if ammonia is used then the lid must be on otherwise it evaporates and the solution becomes less alkaline. But you probably know this. 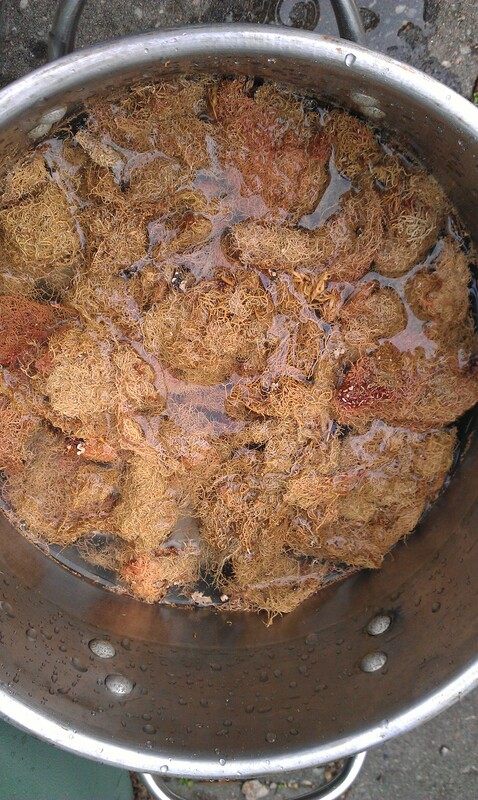 The good thing is as you mentioned that there is plenty other sustainable dyestuff to substitute lichen. I have a good book in dyeing with lichen should you need some additional information. .. The green tree lichen which is so abundant and available near my house in fact did about the same result as yours! sorry this is such a long comment! I look forward to seeing your not-exactly-purple results… sometimes unintended effects are really lovely, and sometimes not so much! It sounds as though you learned a good deal from your first two experiments, which is a fine thing indeed. My past attempts with lichen came out pretty much like yours. Clearly you can get better results but like you I don’t have the urge to play with such limited resources. 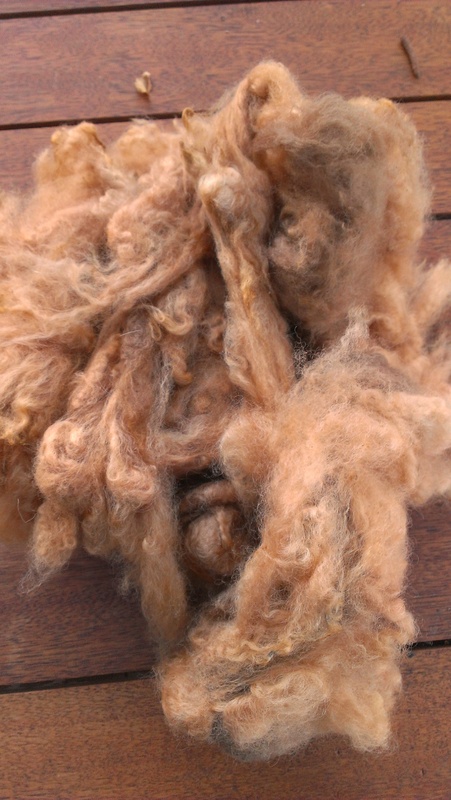 But always interesting to hear how others fare with different dyes. I started experimenting with lichens about a year ago and the results have been quite amazing. 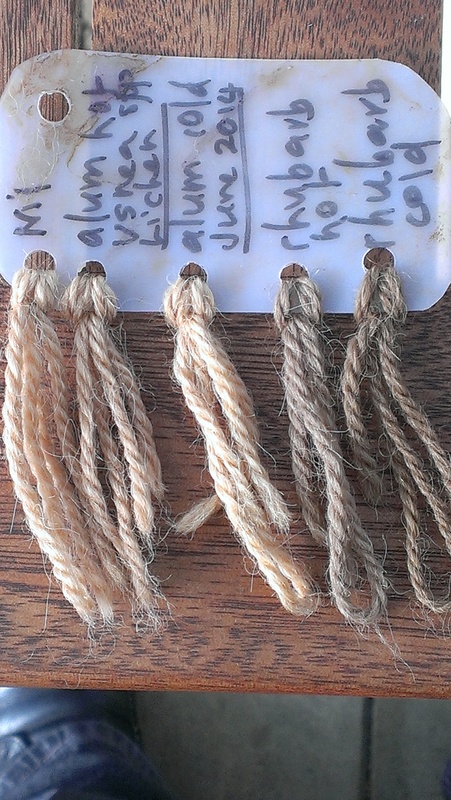 Two recommendations – use the lichens whole or put your yarn/fiber in the stocking. That way you can keep using the dye-bath over and over. I make little butterflies of the yarn each week and test the color. Some colors take as long as 6 months to finally develop ( a pink to purple). Others reach their color in a week and stay there.